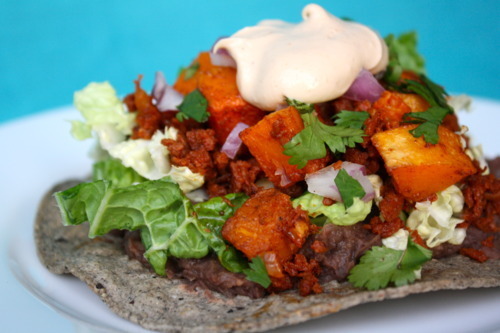 The inspiration came from this recipe that I had posted on my Veganize It! Board on Pinterest. 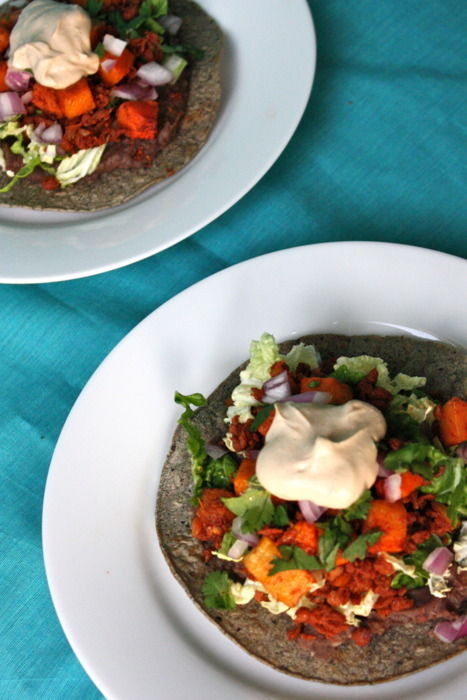 The dish sounded so yummy & I knew it would be so easy to make vegan with a simple swap of soyrizo, the omission of cheese & the addition of cashew sour cream. It’s been a while since I’ve played in the kitchen & this gloomy day gave me the perfect excuse to stay indoors for the better part of the afternoon & cook. Roast the butternut squash. I had 1/2 of a Suzie’s Farm butternut squash on hand, which I peeled, cubed, & tossed in chili powder, smoked paprika, cumin, cinnamon, sea salt & olive oil. You would not believe the warm & inviting aroma that wafted through the kitchen. The flavor was even better. This would be beautiful tossed with some arugula & maple vinaigrette for a simple winter salad. Make the “Cashew Sour Cream.” I used the recipe from Colleen P-G’s “The Vegan Table”, but a similar recipe can be found here. Colleen’s recipe did not call for soaking the cashews, which I was a bit leary of. I gave it a shot & threw everything in my Vitamix & to my surprise, it turned out just as smooth & creamy as it would’ve if I’d soaked them. I do recommend soaking for a least a few hours, if not overnight, if you do not have a high speed blender. 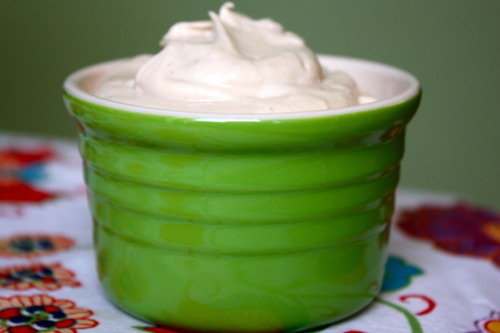 Mmmmm…I love cashew cream! This dish requires a lot of prep, so it would be fun to do as a friend or family affair. 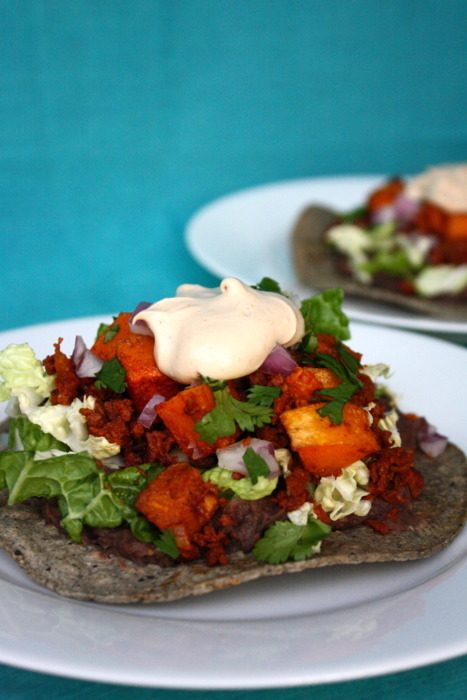 While the butternut squash was still roasting, I cooked the soyrizo, shredded cabbage (another addition), chopped onions, cooked the beans & toasted the tortillas. Finally…put all the goodies together! Yum Town Buffet. Seriously. Such wonderful flavors together. 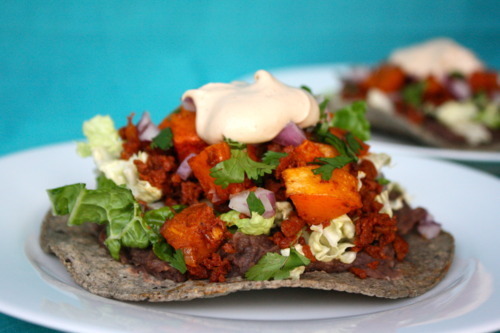 Warmth from the roasted squash, heat from the soyrizo & red onion, crunch from the tostada & cabbage, & creamy-rich goodness from the cashew sour cream. 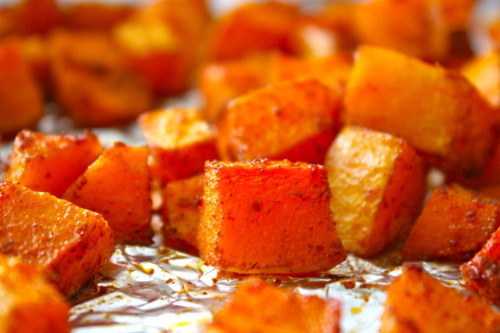 Toss squash in the oil, chili powder, smoked paprika, cumin, cinnamon & salt, spread the mixture out in a single layer on a baking sheet & roast in a preheated 400F oven until the squash tender & starts to caramelize on the edges, about 30-40 minutes. Heat the oil in a pan over medium heat. 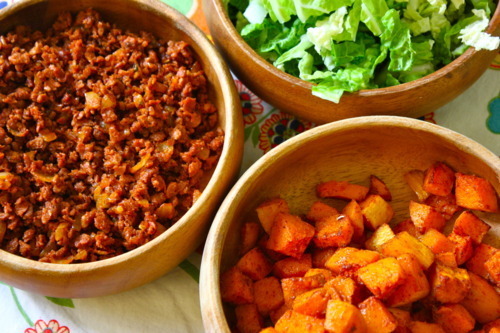 Add the soyrizo, cook until browned, about 5 minutes & set aside. Brush the tortillas lightly in oil & bake in a preheated 350F oven until golden brown & crispy, about 3-5 minutes per side. 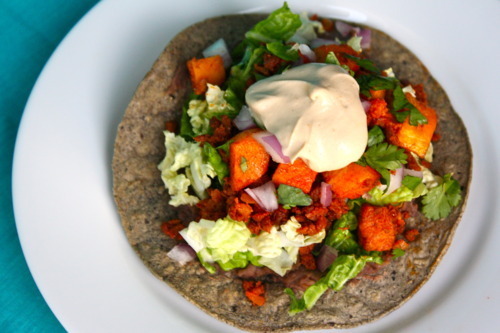 Spread the refried beans over the top of the tortillas, sprinkle on cabbage, soyrizo, roasted squash, & red onion & top with cashew sour cream & cilantro. Such a fun afternoon with such a sweet reward. Yum! I even got to use some of the photo techniques I learned from Isa, Susan, & Hannah at Vida Vegan Con & finally busted out the fabric scrap that Isa gave me to use as a background. One of these days I’ll get around to fully recapping the VVC experience. Perhaps over winter break? Until then, happy eating to you & happy kitchen clean up to me!